TLooking for a chair that is for that special child in your life that has outgrown their toddler's chair? This rustic rocking chair is the perfect size for a youth or small adult. It measures 21" wide by 32" deep and 38" high. It is shown in red oak wood with rustic hickory twig accents. Please call with questions on our rustic hickory furniture handcrafted by the Amish. 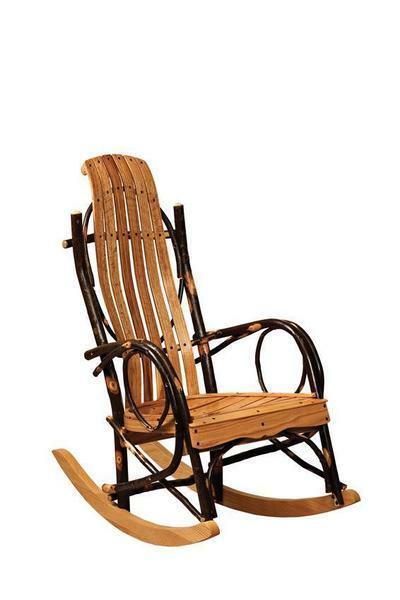 This hickory rocker is sure to become a treasured family heirloom that is passed on for generations. Our Amish Children's Furniture at DutchCrafters is quality construction and proudly made in the USA. We feel proud to sell American made products at DutchCrafters. We also offer Amish Hickory Child Size Rockers. Call one of our furniture specialists with questions or ordering assistance on our kids rockers and rustic furniture.